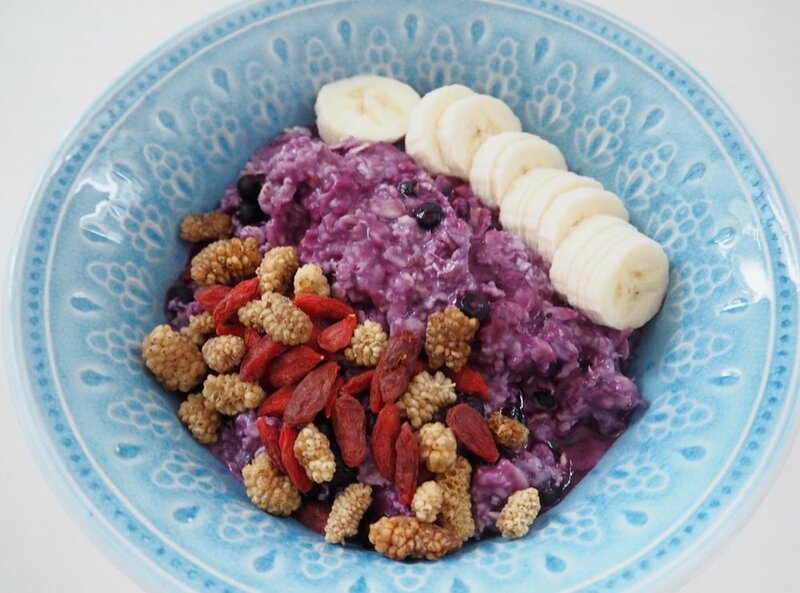 We’re huge fans of colorful food, like smoothies and acai bowls. However, during the colder months it can be nice to get some warm food into our freezing bodies. This oatmeal is a perfect way to start the day, but can as easily be made for lunch or in the evening as well. Maybe after a workout or simply when hunger strikes. Just don’t forget the blueberries; it’s what gives it the lovely color. Mix the oatmeal, frozen blueberries and water and bring to boil very slowly, and don’t forget to stir. After about 2-3 minutes it’s done. Top with the banana and superfood and you’re ready.